The New York Yankees took down the Twins in the AL Wildcard Game, and then overcame a 2 game deficit against the Indians to advance in the playoffs against the Houston Astros. This success marks the franchise's 53 appearance in the MLB playoffs - the highest among all teams in either league. 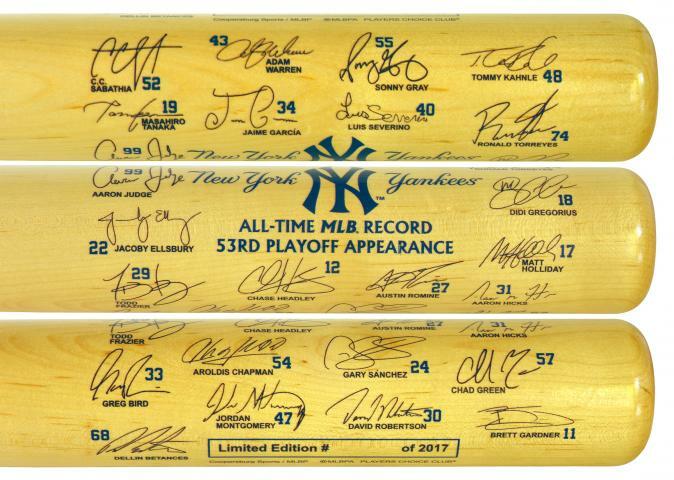 To honor the team's record-setting 53rd playoff appearance, we are pleased to offer this custom, full-size collectible bat featuring the facsimile signatures of the *players on the 2017 Yankees team. This special commemorative bat is an ideal addition to any fan's collection of New York Yankees championship memorabilia. *Due to a contractual conflict, the signature of Starlin Castro does not appear on this bat. 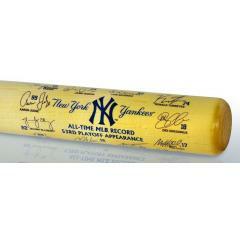 Yankees MLB Postseason Record Team Signature Bat $129.95 Sold Out!